UFC 227 has come and gone, offering the mixed martial arts world a stunning turn of events in one of the sport’s most stable divisions. UFC 227 has come and gone, offering the mixed martial arts world a stunning turn of events in one of the sport’s most stable divisions. We have a new champion at 125 pounds, as well as a new “greatest of all time” champion at 135. From close decisions to no-question knockouts, UFC 227 delivered on all fronts to satisfy our need for competitive drama. Here, we take a look at the top three takeaways as we move on from the UFC’s night at the Staples Center in Los Angeles. ## Henry Cejudo’s close win shouldn’t make him the favorite in a rematch Looking to make right on a disappointing first try at dethroning arguably the greatest fighter of all time, Henry Cejudo walked into the Staples Center Saturday night laser-focused on shocking the world as a +350 underdog. He did that -- sort of -- receiving a [narrow split decision](https://www.betchicago.com/demetrious-johnson-record-henry-cejudo-ufc-227) to become the first fighter in UFC history to defeat a flyweight version of Demetrious Johnson (-500). Just like that, Johnson’s historic title reign came to a screeching halt, ending his championship run at 11 straight. Cejudo, perhaps self-aware of just how fortunate he was to get the nod and reach the championship pedestal, wasted no time in inserting himself into a long-awaited super-fight against the standing bantamweight champion. Not so fast. If the UFC has any understanding of what needs to take place, it’ll book an immediate trilogy between Cejudo and Johnson either later this year or early next. And despite Cejudo’s ability to earn a split decision over a dominant champion, there was nothing in his victory to indicate he should be the betting favorite in Part III. 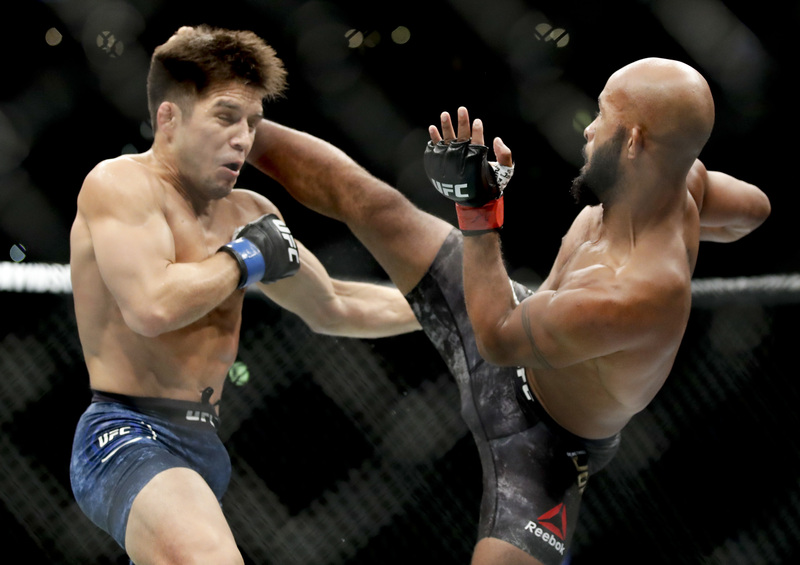 Cejudo came into the fight with a solid game plan, albeit one that wouldn’t have been remembered long-term had his opponent not been named Demetrious Johnson. Wrestling was the foundation of Cejudo’s success, needing only a handful of timely takedowns to hand the favorite a stunning loss. Whether or not Johnson is actually the favorite next time out remains to be seen, but he should be. After 13 consecutive victories at 125 pounds, 11 of which came in the form of a record-setting run as the inaugural flyweight champion, a single controversial defeat shouldn’t rob him of his status as the toughest task in the division. Cejudo supporters rejoiced in their ability to cash in on his underdog status, but likely won’t be afforded such a profitable line next time out. Expect Cejudo to be given more respect, just not as the favorite. Not after what we saw Saturday night. ## The small-man super-fight is dead (for now) Henry Cejudo wants it. T.J. Dillashaw wants it. It’s possible the UFC may even want it as well, but the once highly anticipated super-fight between the UFC’s flyweight and bantamweight champions has effectively lost a majority of its luster. For the time being, anyway. Dillashaw (-120) held up his part of the bargain, knocking out rival Cody Garbrandt (-110) before the end of the opening round in their main event at UFC 227. Johnson appeared to do the same earlier in the night, fighting a closely contested battle that arguably should have gone his way. It didn’t, though, potentially robbing “Mighty Mouse” of the greatest payday of his storied UFC career. That opportunity, should the UFC grant it, now belongs to Cejudo. The career-defining payday, however, does not. The UFC feared a bout between Dillashaw and Johnson would struggle to sell to the general masses, denying both men of the sort of paycheck often associated with a fight of this competitive magnitude. And that’s with Johnson, easily the most successful champion in UFC history, standing in one corner. Replace him with Cejudo, who only narrowly and not-so-convincingly defeated Johnson, and it’s all but assured to go under the radar. Add in the idea that Cejudo would hardly be considered a compelling foe to a larger, more complete titleholder in Dillashaw, and suddenly this potential champion vs. champion contest becomes an impossible sell. ## MMA’s unforgiving nature swallows another would-be star There were few fighters with as much momentum heading into 2017 than Cody Garbrandt. Four victories in 2016, the last of which came in the form of a stunningly effective performance against an impossible puzzle in then-champion Dominick Cruz, Garbrandt was pegged by many as the next big star in MMA. This became an especially plausible reality considering how much excitement surrounded his first defense as bantamweight champion: A highly anticipated grudge match with former training partner and ex-titleholder T.J. Dillashaw. After nearly a year’s worth of back and forth, the two finally shared the stage in the co-main event of one of 2017’s biggest pay-per-view events at Madison Square Garden last November. Only Garbrandt’s reign ended just as quickly as it began. After nearly securing the win in the opening round at UFC 217, Garbrandt suffered a knockout defeat to Dillashaw in Round 2. He would be granted an immediate rematch nine months later, a decision deemed questionable both in terms of divisional matchmaking and Garbrandt’s career trajectory. “No Love” had just suffered his first career defeat in emphatic fashion, and was now forced to prove he could face the same man and correct the mistakes he made in their original bout. He couldn’t, highlighting the very same errors that cost him the title on Saturday night in Los Angeles. Over a nine-month span, Garbrandt goes from one of the UFC’s most promising young stars, to a fighter who’s now been knocked out twice in consecutive fights by the standing champion in his native division. A third crack at Dillashaw is unlikely, with Garbrandt’s future at 135 pounds seemingly in question. Of course, at just 27 years old, Garbrandt still has time to make the proper corrections to reach the mountaintop again, but it’s almost certain his second rise won’t come with the sort of star-making impetus associated with his first.